My first taste of anything Faroese was the language itself, when a friend sent me Týr’s Ormurin Langi, a heavy-metal recording of an old Faroese ballad, almost a decade ago. Later, I would come to know the landscapes, the culture, and the people as well, but part of me fell in love with just the words themselves. In a way, that’s very fitting. Language is a hugely important part of cultural and national identity. You’ll find it at the heart of many a nationalistic movement. The Faroese language and its use played an important role in the movement towards Faroese autonomy, and continues to be a factor in negotiating distance from Denmark and concepts of what the Faroe Islands should be today. Until the mid-20th century, Danish was used in official matters, education, literature, and religious institutions. Even today, because of the size of the community, a huge variety of imported products and media are not translated into Faroese. The Faroese TV station, when it runs out of Faroese material, switches to whatever it can get from Danish, Icelandic, Norwegian and American programming, generally subtitling in Danish if at all. 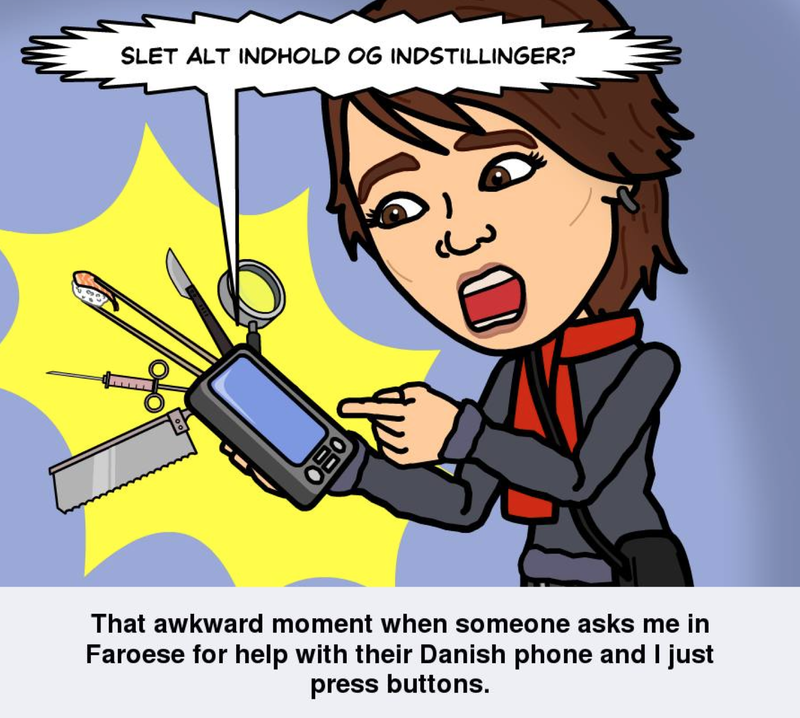 The cell phones are Danish, and if you want to text in Faroese you’ll have to turn off the auto-correct and switch over to the Icelandic keyboard every time you need the letter ð (edh). Despite the huge push to translate all sorts of things from all parts of life, children still have to use many Danish textbooks and sometimes even take their exams in Danish. At a minimum, the Faroese are bilingual with Faroese and a local variety of Danish called Gøtudanskt, but many also speak good Danish, are trilingual with English, and even multilingual with other foreign languages on top of that. One could spend twenty minutes just explaining the history of Faroese in conjunction with the other Scandinavian languages, but, in an attempt to make things brief, Faroese is descended from Old Norse, just like Icelandic and Norwegian. Danish and Swedish developed in a rather different direction, but Danish then had a huge effect on Faroese and especially Norwegian when they were under Danish rule. The result is that Faroese and Norwegian can be considered the most central of all Scandinavian languages, with Faroese retaining more grammatical complexity and similarity to Icelandic and Old Norse. The Faroese are in fact the best in the region at understanding all of the others. Faroese is a highly inflected, highly irregular language with an inconsistently phonetic writing system. When I say Faroese is highly inflected, I mean that they love “bending” words – or conjugating their verbs and declining their nouns. Verbs take different forms depending on who does them and when, and nouns are even worse. There are three different noun “cases” – Nominative, Accusative, and Dative, depending on whether the noun is acting as the subject, object, or direct object or according to its place within a certain idiomatic expression. Nouns come in three genders, and within each gender there are several possibilities for how the words within that gender can be bent. Then, of course, you also have to think about definite vs. indefinite nouns, because the definite marker goes at the end of the word and affects the bending. If you’re keeping track, that means each noun has 12 forms – not counting four genitive ones which are now rarely used. 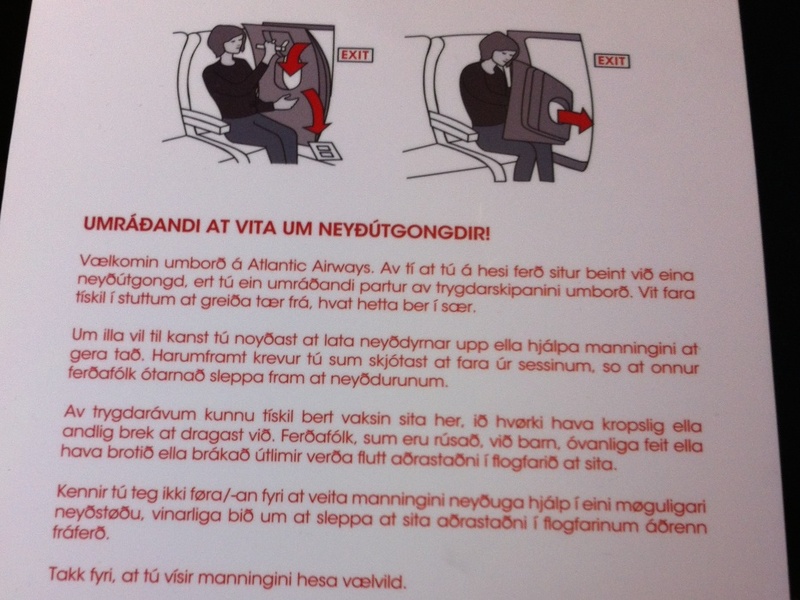 Emergency Exit Row instructions in Faroese on at Atlantic Airways flight. When I say Faroese is irregular, I mean that, despite all of these rules, you’ll find almost as many words that vary from the rules in at least some small way as you will words that follow them exactly. You’ll also find alternative ways to say all sorts of things – head, for example, can be høvur or høvd, or even heysur or knokkur. Faroese also has some rare and strange vowel sounds, much as English does. This has been really hard for me to get used to, even though it’s not that different from my native language, simply because I’ve gotten so used to purer, simpler sounds in every other language I’ve learned. So you have to get used to that sort of irregularity. The Faroese writing system is one of the biggest headaches for both native and foreign learners. I’m constantly asked here if I can also write Faroese. It would be very easy for someone learning the language by ear here to be completely illiterate. The relationship between the letters and the sounds is quite irregular, like in English or French, and takes a lot of getting used to. The reason for this is that when the written language was developed, and quite late at that (1854), the primary goal was not phonetic fidelity but rather etymological clarity. The written language is so clear about its roots that I can basically read Icelandic and Old Norse now, even though the spoken language has diverged greatly since that time. A secondary advantage of this writing system is that it avoided privileging any specific Faroese dialect (yes, that’s right – in a nation of less than 50,000 people, there are several dialects). That latter is what I’ve been told, anyway. From where I’m standing, it seems to me that that’s true only because the written language is so out of touch that it works equally poorly, and thus equally well, with every spoken dialect. To give just one – although admittedly particularly egregious – example of the spelling nonsense, consider the letter ð (edh). Students of linguistic notation, Old English, or Icelandic will think they know this friendly character. It normally makes a voiced th sound (like in “then” or “there.”) Not in Faroese, though. In Faroese, it means whatever it feels like. Usually that’s some sort of semi-vocalic glide, like a W, V, or Y. But sometimes it’s a G. In exactly one word, it’s a D. I only wish I were joking. “Gjógv” is the name for this village and the Faroese word for Gorge. Think it’s pronounced Jogv or Gyoegv? Think again. It’s more like Jeggv! All of this makes Faroese quite a bit harder than the average Indo-European language to learn. But I also find it also incredibly rewarding because it has such a tight and fascinating connection with the culture here. It’s lovely to see how much people value and take an interest in their own language — that enthusiasm makes the learning process, even if slow and slightly painful at times, an adventure I’m happy to embark on. 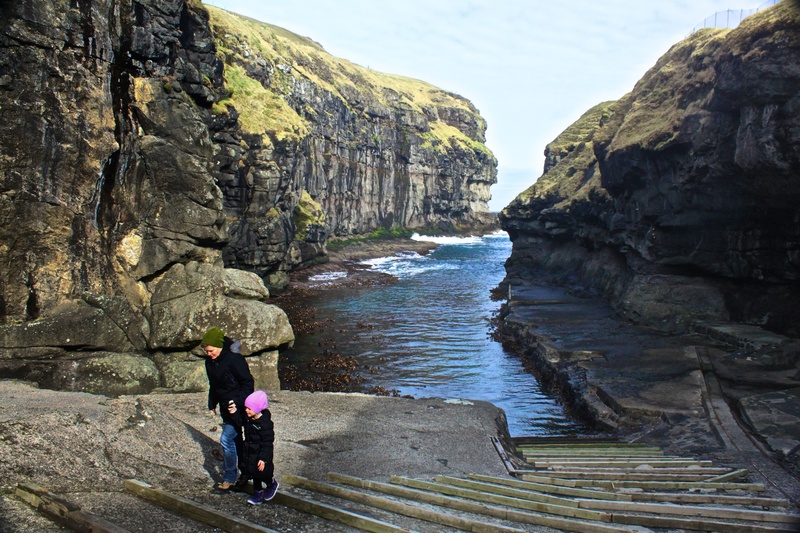 This entry was posted in Faroe Islands, History, Language and tagged Faroe Islands, Faroese, Faroese Language, Icelandic, Language, Linguistics, Travel on June 5, 2014 by Miranda Metheny.